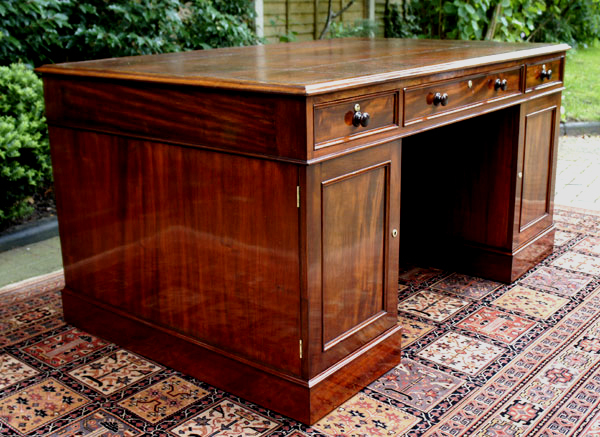 This is a rare and stunning antique partners desk made to the highest standards. It has very pleasing proportions and beautifully figured timbers and has recently been restored and benefitted from french polishing. A very handsome antique desk retains its original burgundy writing leather top with gilt and blind tooling. This is very rare as most antique desks of this age have had a number of replacements over the years. 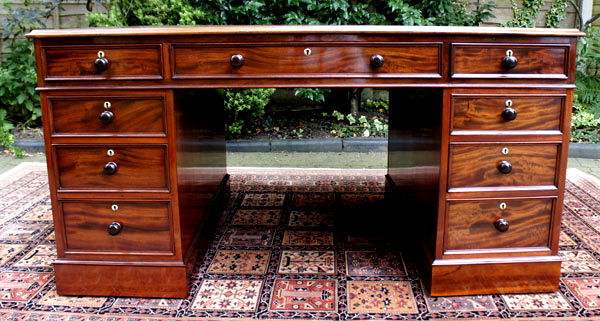 This is a rare and stunning antique partners desk made to the highest standards. It has very pleasing proportions and beautifully figured timbers and has recently been restored and benefitted from french polishing. It is in in good condition but naturally has numerous scuff marks and stains accumulated over the years of use. The leather writing surface is surrounded by a one inch band of mahogany with a thumb moulded edge. The top is fitted with three drawers to each side of the width. The pedestals are fitted with three drawers to the front and cupboards, with an adjustable shelf, to the reverse. All drawers are constructed with hand cut dovetails, mahogany linings and brass locks. The drawer fronts have ogee moulded edges circular brass escutcheons and turned mahogany wooden pull knobs. As with most antique pedestal style desks it is made in three sections, a top and two pedestals for ease of installation. The pedestals have hidden castors under the plinth bases for ease of movement. Thomas Willson is entered in directories as a furniture broker and appraiser of 68 Great Queen Street, between 1821 and 1829.
furniture works and upholstery business at the same address. 'THOMAS WILLSON, Cabinet Maker, Upholsterer, & co. 68 GREAT QUEEN STREET, Lincoln's Inn Fields, London. Every article of furniture for the Drawing, Dining, Bed Room and Library of first-class make. Established 1818.
can be divided into second hand pieces, which were merely retailed and items made in their own workshop for sale. There is no doubt that both of these desks were made in the same workshop in the same period.